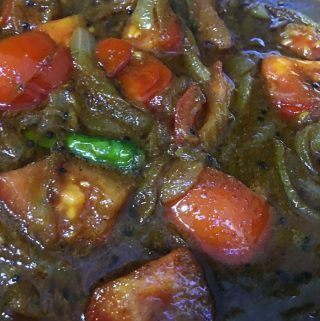 Spicy tomato curry recipe gives you delicious, spicy stir fried tomatoes in an onion masala gravy which is perfect side dish with chapathi, poori or even rice. 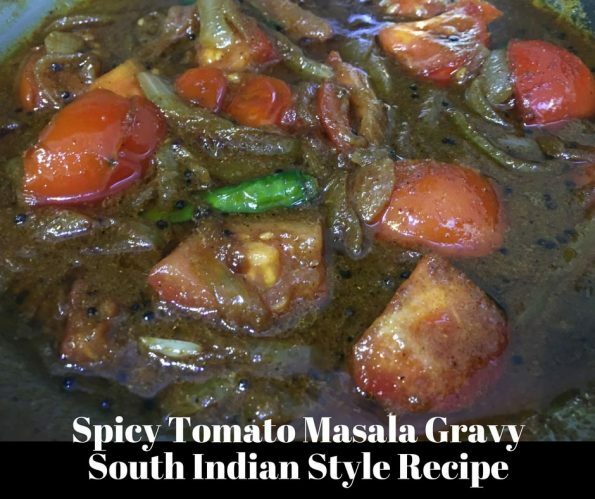 If you love spicy South Indian style food, you will like this spicy tomato gravy made following this easy and spicy tomato curry recipe. We use garam masala powder, red chili powder, green chilies, ginger garlic paste, black pepper powder etc (you may also use crushed garlic cloves and crushed fresh ginger instead of ginger garlic paste) which will all add spiciness to the dish. You may adjust the level of spiciness by slightly increasing or reducing the above mentioned spices which gives spiciness to this yummy tomato gravy. We use a little more oil in the gravy, as it is needed to make the gravy very delicious. I recommend using sesame oil (or use coconut oil or sunflower oil or canola, if you don’t like sesame oil) for the best flavor. So here is how you can make this easy and yummy tomato curry following this spicy tomato curry recipe. This spicy tomato curry recipe also known as thakkali curry or tomato fry with gravy is made in South Indian Kerala style, which makes an easy, spicy and delicious side dish with chapathi or poori. Wash and peel the onion in thin long slices, keep aside. Heat 2 tablespoons of oil in a pan and add mustard seeds. When the mustard seeds splutter, add the curry leaves, fry for a few seconds. Add the sliced onions and let it get stir fried in low to medium heat for about 8 to 10 minutes until the onions are lightly browned, keep stirring occasionally. Meanwhile, wash the tomatoes, slice as little thick medium sized pieces and keep it aside. Once the onions start to brown, add enough salt and ginger garlic paste, stir well and saute in medium heat for another 2 minutes. Add the following spices - turmeric powder, red chili powder and coriander powder to the onions, mix well and let it stir fry for another 2 to 3 minutes. As the onions get stir fried in the spices, add the sugar and water and bring the mixture to a boil. In case the gravy is less for your preference, you may add a little more water, but we really do not need more water as we also add the remaining two tablespoons of oil at the end of the preparation, which will add to the gravy. So if you are adding more water, keep this also in mind so you can add accordingly. As the mixture starts boiling, reduce the heat to low and add garam masala powder and black pepper powder to the mixture, stir well and cook in low heat for another 1 minute. Add the chopped tomatoes and remaining 2 tablespoons of oil to the pan, stir well, reduce the heat to low and cook for another 1 to 2 minutes or until the tomatoes are lightly cooked and stir fried in the gravy. If needed, you may add a little more oil as to give the tomatoes more of a fried texture. 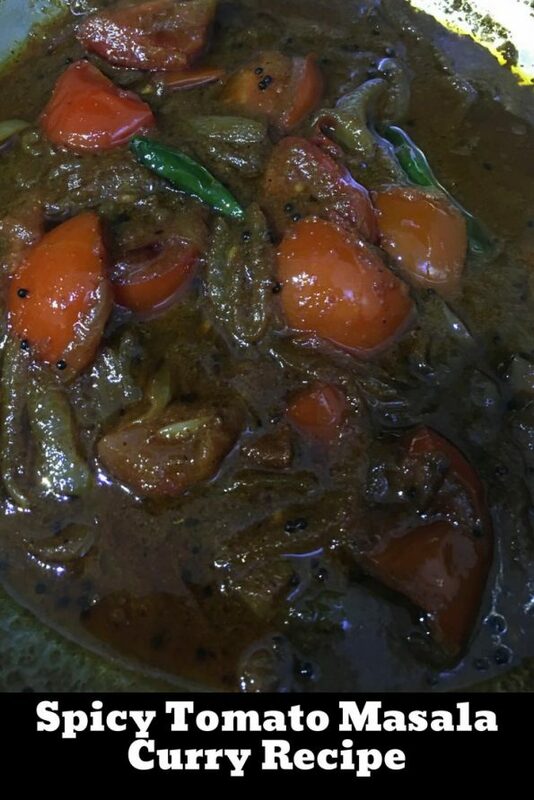 Spicy and delicious tomato curry or tomato masala fry with gravy is ready to be served. Make sure not to overcook the tomatoes for this spicy tomato curry, as we really need the tomato chunks to be there without getting it mashed up in the gravy. 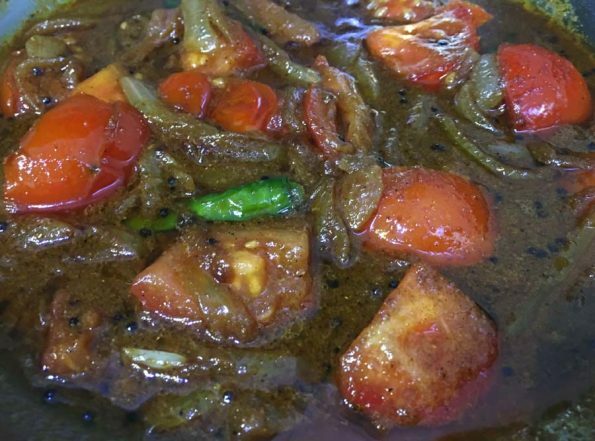 The light cooked and lightly stir fried tomatoes, as you can see in the pictures in this post, is perfect for this spicy tomato curry or tomato masala fry with gravy. Enjoy this tomato curry as a spicy and yummy side dish with chapathi, poori or rice as you wish. 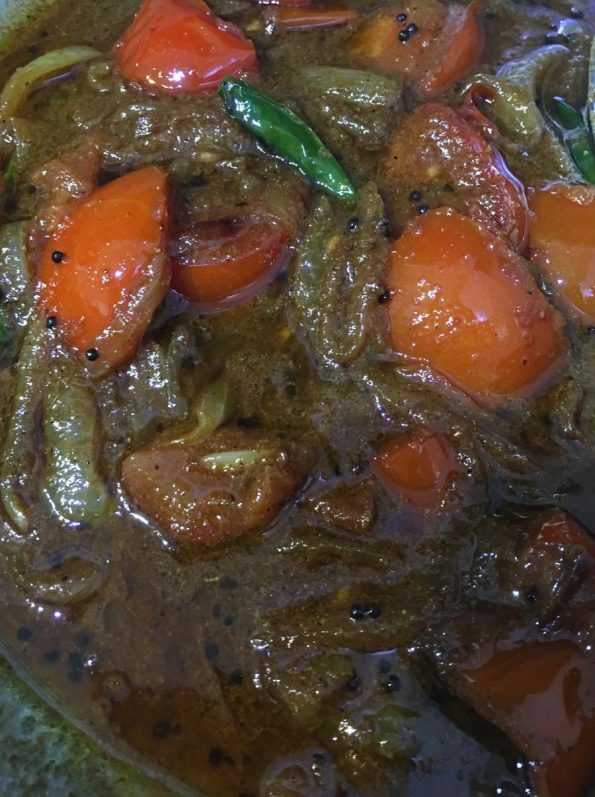 Hope you found this post on spicy tomato curry recipe helpful in making easy, spicy and delicious tomato masala curry for a spicy side dish for chapathi or poori.